Preheat oven to 400°F. Lay sweet potatoes in a single layer on a large, rimmed baking sheet. Drizzle with 1 tablespoon of the oil. Sprinkle with 1/4 teaspoon of the salt; toss. Bake about 30 minutes, turning once, until tender and golden brown. In a small saucepan, combine quinoa, 1/2 cup water, and a pinch of salt. Bring to a boil. Reduce heat to low. Cover pan; simmer about 12 minutes. Remove from heat. Let stand 5 minutes; fluff with a fork. Let cool. In a small bowl combine remaining 2 tablespoons olive oil, vinegar, honey, mustard, poppy seeds, pepper and remaining 3/4 teaspoon salt. 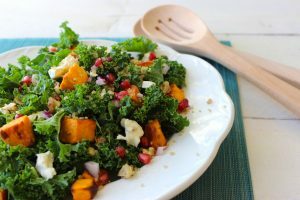 In a large bowl toss kale, sweet potatoes, toasted walnuts, quinoa, and dressing. Transfer to a serving platter. Top with pomegranate seeds and goat cheese.